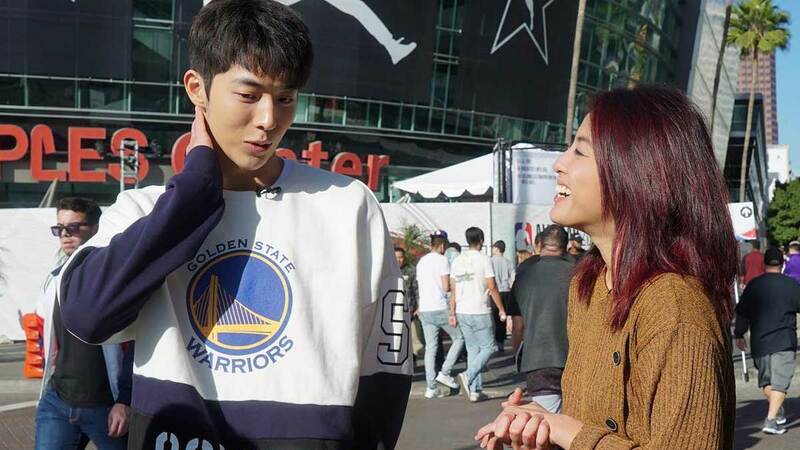 Gretchen Ho got the assignment of a lifetime when she was flown to the States to cover the 2018 NBA All-Star weekend in Los Angeles, California. The ABS-CBN newscaster was able to sit down with a slew of prominent basketball figures, but one celeb we're suuuper jealous of her meeting was K-drama star Nam Joo Hyuk. Gretchen posted a photo of her with the Weightlifting Fairy actor (wearing a Warriors sweater no less!) outside the Staples Center and wrote on the caption, "Good morning guys :) Hindi naman ako masyadong kinilig. Hindi naman." ICYDK, Nam Joo Hyuk is a HUGE basketball fan, specifically of the Golden State Warriors' Stephen Curry. He probably flew to the States to watch his main man live. And he even got the chance to play with him one-on-one!